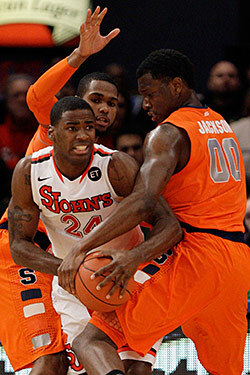 The Johnnies hung with Syracuse for about eight minutes last night, even opening up a 17–9 lead at one point. But then came a 26–7 Orange run to close out the first half, and by night's end, Syracuse would be one of four remaining unbeatens following its convincing 76–59 win over the Red Storm. If Jack Bauer came hoping to see a classic Big East matchup at the Garden, he left disappointed. "It's still a rivalry, it's still a big game, but it's like the Jets and the Patriots, you've got to win games." This is indeed a one-sided rivalry right now — the Jets, actually, have had more luck against New England lately than St. John's has had against Cuse — but let's not forget that St. John's is still in the early stages of what they hope is a turnaround for the program. (And advertising campaigns aside, St. John's can still capture this city's attention in ways Syracuse cannot — but that turnaround needs to happen first.) In the meantime, the Red Storm have plenty more chances this month alone to show they can compete with the elite teams in the Big East. (Next up: a rematch with No. 11 Notre Dame on Sunday afternoon.) As for Syracuse, at 17–0, they can set their sights a bit higher.